New to our Fundraising Pages? Start here! An Everyday Giving Page is our most flexible donation page. Whether you need an all-purpose appeal to collect donations year-round, or a page dedicated to a specific fundraising campaign, the Everyday Giving Page is the right donation page for you. 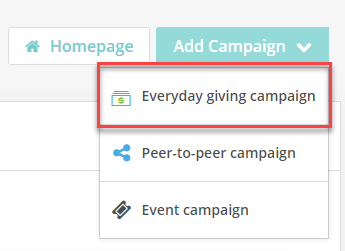 You can create a page from the My Campaigns dashboard in your Fundraising Pages account. Need a reminder on how to navigate there? 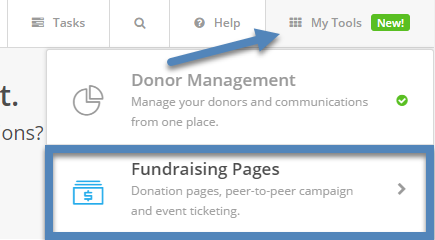 Start by clicking My Tools in the upper-right corner of Donor Management and select Fundraising Pages. From your dashboard click Add Campaign then Everyday giving campaign, and we'll walk you through every step of the way! The whole process only takes about 30 minutes to complete. Once you're done you'll have created a beautiful, customized donation page ready to share on your website, in email, and across the internet. Sign up for a live webinar to get a step-by-step walk through of building your first page! For more details and step-by-step instructions, check out our user guide here.